Had seen this interesting topic in both the traderji and mudraa forum and the credit goes to the creator Mr.RAMDAS DUMBRE(Mumbai). As everyone knows that most of the MT4 platform is available in demo account at free of cost. So importing the google intraday datafeed into metatrader could be boon for market learners & small investors and for those who cant spend on hefty money on paid softwares and datafeeds to analyse the stock markets. This article explains how to import Google Intraday and EOD NSE datafeed into metatrader. 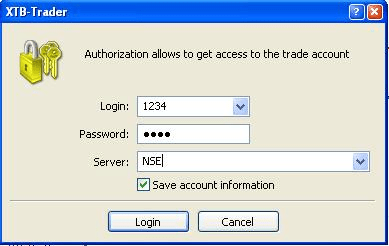 3)After installation complete MT4 will start and ask you for login or ask for account creation. Cancel all, we don’t need to create any account with any broker, we don’t require to login to any broker server. Close MT4 and go to step 2. 2)Extract or Unzip the MT4 Stock Chart V10 files to local drive. 1)Start MT4, it will ask you to login, put 1234 in login and 1234 in Password field. 2)Put NSE in server field. 3)Click save account information and click Login button. 4)Login window will go and server connection status at right bottom corner of MT4 will be not connected. 2)You will see Market watch window with symbols name, right click on any symbol and select Show All. This will show all symbol in market watch. Step 5 Opening new chart. 4)Then go to Custom Indicator and select indicator NSE Stock Chart V10 Apply this indicator on Chart. Why we saved this template as default ? And indicator NSE Stock Chart V10 fetch data from google finance and creates 1min, 5min 15min, 30min, H1, D1 chart. Now click on 5min timeframe button and you will see 5min chart, like this you can click D1 button and you will see daily chart. Button W1 timeframe on toolbar is used to clear all timeframe charts. In short. MN creates charts of M1 to D1 Timeframe and W1 delete M1 to D1 Timeframe chart data. Note. When you click W1 still you will able to see M5… M15 chart since data is already loaded in MT4 RAM and it will get clear when you restart MT4. Now you can open any chart by right click on symbol name. After 1 to 3 sec blank chart will open, and then you can study M1 to D1 chart by clicking M1 to D1 Timeframe buttons. Note: M1 15day data featch from google takes 2 to 3 sec that’s why when new chart open, it takes some time to open. If you select only D1 and M15 timeframe which you can do in indicator propertythen chart will open fast. Only M1 takes little longer time. How to create your own symbol list. Then open any chart and apply script Script Create Symbol List V10 on chart and then restart MT4. And follow step 4 to show all symbol. This is important file , when you open new chart it is open with this default template.By default chart with time frame MN will get open , you will not see any chart on MN timeframe. And indicator NSE Stock Chart V10 is already attached to chart. then when you click timeframe button M5 or M15 you will see those charts. default.tpl template with some moving average attached with the download file. When you want your own template with your indicator, you have to create your own template and save it with some name, and you can just apply that template on chart when all timeframe chart get created. When you want to create your own default template you have to create it on 5min chart or any other timeframe except MN and W1 timeframe. Step 1: Open 5min chart apply all indicator which chart settings as per your requirement. Step2: Apply indicator NSE Stock Chart V10 on chart. Step4: go to folder templates and open file default.tpl with Notepad. Step5: on 3rd line put period=43200 this 43200 is timeframe MN. Step6: save this file and you are ready to open chart with your own default template. 1min data featch is disabled, since it takes longer time to featch 1min data. you can see indicator property M1 it is set as false. if you want to see 1min chart just open template file default.tpl with notepad …go to bottom there you will something like below…make M1=1 and save defauilt template file.Then it will show you 1min chart. pl click W1 button to delete old data, then restart MT4. For using realtime, you have to login to some demo accout, then open any chart which is moving, Nifty chart will be good. In indicator property under stock name put e.g ACC . then go to MT4 – File -> Open Offline –> ACC 5Min chart, and you will see it changes realtime on every tick of Nifty. In realtime on every tick of Nifty chart data is pull from google finance and chart is created. on ACC 5Min offline chart you can out any indicator and it will work. if you want ACC 15Min chart, Then just change Nifty chart to M15 and open ACC M15 Offline chart. I tried this, but the only symbol I got was 3IInfotech -- the first one. DEAR SIR , PLS TELL ME HOW CAN I RUN GOOGLE INTRADAY AND EOD IN AMIBROKER…..LIKE AS MT4…….? Great work sir. I think such a option and you provide this for all of us. How is your married life? Sir will it work during intraday in real time? I think that the above querries of your readers kapildev and theo has already been solved. Sir please refer my above querries. I found myself that it is not for intraday, it can download only available latest data from Google. But if Metatrader is refreshed like Metastock (while connected with ManshiRT), it can download the data from Google finance in real time. But i am not capable of creating one. It is possible for those who created such a great stuff now you provided. This new thing you provided is a great work. I checked the mq4 files. What a Mandai !!!!!!!!!!! Konnudanka !!!!!!!!!!!!!! As now we can use the Metatrader also Please provide the best intraday indicator collection for real time trading through Metatrader like provided for Amibroker and Metastock. I followed sincerely the above given procedure and I get all the options as provided by the Software developer Thanks to you all. do i hve 2 install another XTB demo platform & open 5min nse chart side by side wid dis platform (all signals) or do u mean 2 open NSE 5min chart in d same platform?? bt dt is nt possible as it will be on a diff server!! ITS NOT WORKING IN REALTIME PLS HELP ME………..
DEAR SIRJI……..MY MOBILE NUMBER IS -- 08128010800 ……PLS GIVE ME YOUR MOBILE NUMBER………. Please any One Help ME…. I tried A lot Not even Symbol i am Getting…. Would it be possible to feed data from EOD Yahoo Data to metatrader similar to EOD NSE? Hope my feedback helps. These are really cool scripts and I truly appreciate the time and effort you put into this. Thank you once again!! Dear sir i had done what you said about the set up the mt4 and nifty folder . but still i got problem for updating as i am using username 1234 and same as password and nse server but still i dont find any connectivity so that i can watch the RT or EOD charts . I had done several attempts but all in fails . pls help me out and give the solution. avinash dont worrry pls try gci trading free software it will give nifty with 10 nse stocks. I am Ramdas, Developer of this tool. I have created forum for giving help regarding this tool. Sent mail to your mail, please acknowledge. Great blog, great tips indeed! Is it possible to use this tools with other markets, namely FTSE, DJ and the like, not just only Nifty ? I’ve tried to do something with other stocks (NSE works perfectly, very useful! ), probably I made something wrong. Should I have to use an extension to the symbols maybe, each for every stocks (as in google symbols I mean, for instance F.MI for FIAT @ MIB stock) ? I created a folder for each stock, but It doesn’t retrieve updated data. Could you please show which passage I should modify of your excellent guide in order to do the same with other stocks? Thank you very much! I love the script. I am trying to get data from US stocks like AAPL etc. It is not loading the chart. What am I doing wrong? As the instruction I have created a new symbols.txt list, import as the instructions. Please can you show me how to do it right, help much appreciated. I INSTAL THE SOFTWARE SO I AM UNABLE TO CONNCT THE SEVER. Which MT4 you had installed and from where? I had the same problem as theo, only the first simbol will show in market watch. 5. now EDIT the file experts/files/symbol.txt by moving the first symbol TO THE BOTTOM OF THE FILE. Save the file. 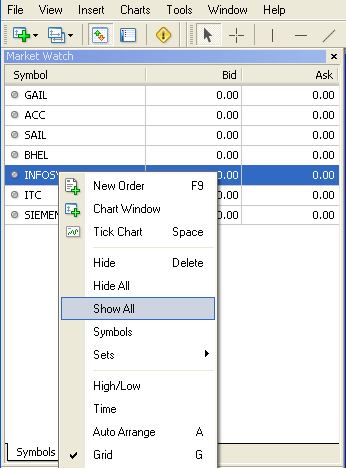 In the end, all the symbols contained in symbol.txt should be correctly displayed and available for operations in the market pane. I would like to express my great thanks for the work you are doing. The inputs you have given on this site are extremely helpful. Please keep up the good work. Can these scripts be edited to download stock data from US markets? If they can, how can I do it? 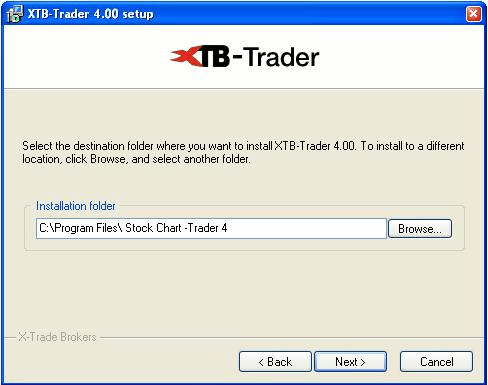 Sir i have installed XTB Trader and did all procedure for the same. i can just see 3iinfotect chart. i cant even see all scripts in Market Watch( After doing Show All). please help me to get realtime google data in Metatrader or Amibroker..
5.now press any of the TF button and hurray! the chart got updated! Please assist me on same. Please provide me detail about real time chart or moving chart with updated data from google finance. I tried Create Symbol List.mq4, but the only symbol I got was 3IInfotech – the first one. i installed it prefectly. But charts are not updating i am getting message waiting for update. Please help me out. I have installed the software as instructed and I could see the charts live but it only shows the live data at the point of opening the stock and thereafter it does not refreshes. ( I also find “No Connection” message at the bottom of the screen. Pls suggest as to what I should do to get live auto-refreshing (streaming ) quotes. Also let me know if there is any way I can use google or yahoo data into Metastock for live charts. I have loaded MT 4 as per your instructions, but NSE symbols do not come. I have uninstalled and re-installed. Now i am getting NIFTY symbols, but charts are not being displayed. I completed all the steps as per your step given . I also got all the stock name in symbol list . I have almost completed 90% of the procedure but not able to get the data to load . I was working on a Sunday Evening ( would that be a problem as NSE is closed) . But i m not getting any EOD data … it is just showing `WAITING FOR UPDATE `. I even downloaded the Realtime data plugin or ex4 file for metatrader . Even that is not updating the data . Hope some one guides us and resolve this problem. I tried with 401 build but I found the same problem. Can you give me please the number of build that it works? And then if you have an exe of this build, it will be a pleasure. Nice to see this information. but I think, the server NSE is no more active and giving the data. Metatrader is not able to do ping test to the server. Can you tell me the way for realtime Excel to MT4 datafeed. Sir I have downloaded MT5. How to feed data in it. It is showing european market data. Is this method to get free NSE data for mt4 still working? Rajendran Sirji ,mt4 nsemcx symbol open nahi ho raha hai ? Ye Kya downlode send kar ? Ye Kya Maza hai? This is outdated now can you please send me the updated version as google not supports the url calls to finance. Google Stopped supplying those data. And there is no updated version I guess.